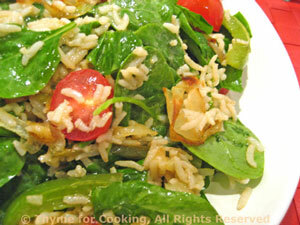 Brown Rice and Spinach Salad, Thyme for Cooking summer food. I'm a big fan of spinach, but not of the usual, over-cooked version. I like it best either raw or only slightly wilted. This salad has sautéed peppers and onions for more robust flavor. Substitute Basmati if you prefer. Wash and spin dry with salad spinner. Put spinach into a large bowl and set aside. Heat 2 tsp olive oil in a medium skillet. Add onion and sauté until starting to brown. Add pepper and sauté until tender and onions are nicely browned. Add vinegar, salad olive oil, cooked rice and stir to combine. Put rice mixture on top of spinach and stir well. The heat will wilt the spinach very slightly. Add the tomatoes, stir gently and serve.